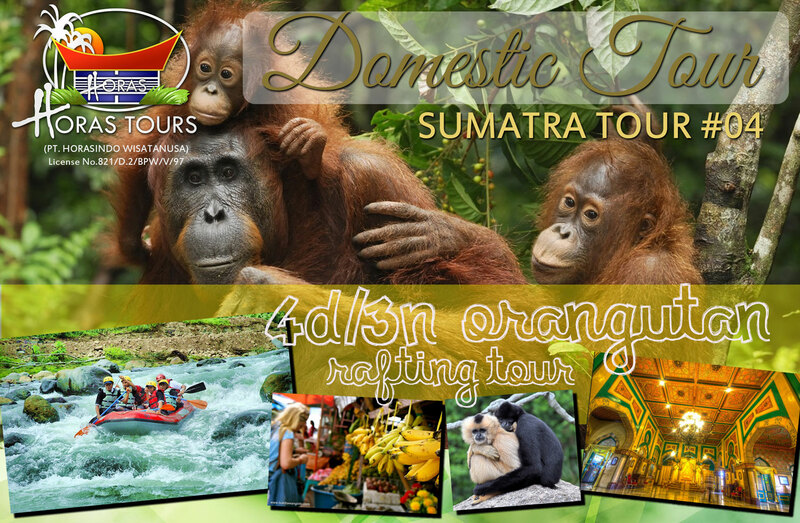 4D/3N ORANG UTAN RAFTING TOUR Day 1 : Airport - Medan – Bohorok / Bukit Lawang Welcome to Medan! Upon arrival at Kuala Namu Airport, you will be welcomed by our guide and depart for a brief city tour to Maimoon Palace and Chinese Temple. Driving north-westward for about 3 hours to Orang Utan Center, you will be treated with vast view of rubber & palm oil plantations, paddy terraces and small towns such as Pematang Siantar and Tebing Tinggi. Stop to see the palm oil plantation, cocoa garden and the local market in Kuala to taste the exotic rambutan fruit. Check in at hotel in Bukit Lawang, and have the rest of the day free for leisure Day 2 : Bohorok / Bukit Lawang : Orang Utan Feeding We’ll start the day early at 7am to catch the feeding process of Orang Utan at 8am. We advise you to wear comfortable clothing and secure shoes for the expedition. Walk down about 25 minutes to the river, cross by canoe and take a short hike for another 25 minutes to the feeding station. Sightings of Orang Utan cannot be guaranteed as they are free animals :). Explore the tropical rainforest with your local ranger on your way back and you may spot leaf monkey, macaque, gibbons, siamang and abundant bird life. Return to hotel and continue with your free activity. Day 3 : Wampu River Rafting - Medan After breakfast check out then depart for Mariki, the starting point of your half-day float trip along the beautiful Wampu River (grade 2 rapids). Sail across the wide jungle river in the midst of unspoiled rainforest, with the pristine nature and tropical wildlife encompassing you. Stop by the waterfall half way down the river for a picnic lunch in the open air before continuing your rafting journey to the Bridge of Bohorok River. Drive back to check in at Medan hotel. Day 4: Transfer Out to Airport After breakfast, feel free to do your own activities until our guide picks you up for airport transfer. To anticipate the current traffic condition, we advise you to leave for airport 4 hours before the flight departure. We trust you had a pleasant trip and sincerely hope to see you again on your next trip! Please enquire with us with your travel needs to get comprehensive price for Sumatra 4 tour package. Feel free to contact us for special tour arrangement.